Over the years, the minds of three different X-Men found themselves trapped in the body of the White Queen - Storm, Jean Grey, and Iceman. Source: Fury's Files (found in the back of Uncanny X-Men #492). Christian Frost probably inspired Emma to wear the color white because it was "definitely" her color. Emma Frost attended the Empire State University (ESU). Notable superheros and villains such as Spider-Man, Black Cat, and Captain America also attended this university. Basically, it's the central university for the Marvel Universe. Believe it or not, Emma Frost's natural hair color is actually brown! While Emma Frost is transformed into her organic diamond form, telepathy is completely blocked from her, including telepathic attacks. Not surprisingly, Emma Frost is a bad cook. She once substituted "one ripe tomato" for Heinz's Ketchup. Emma Frost murdered her sister Adrienne with a gun after she killed some Generation X students. Emma Frost was played by three different actresses: Finola Hughes (Generation X), Tahyna Tozzi (X-Men Origins: Wolverine) and January Jones (X-Men: First Class). Sigourney Weaver was considered to play Emma in "X-Men: The Last Stand," and Alice Eve was set to play the character in "X-Men: First Class," but she dropped the project. 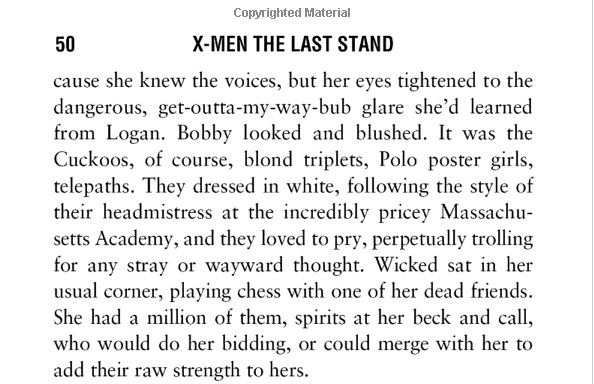 The "X-Men: The Last Stand" novel by Chris Claremont explains the Stepford Cuckoos' past, who made cameos in the movie. They came from the expensive Massachusetts Academy whose headmistress wears all white - an obvious Emma Frost mention!